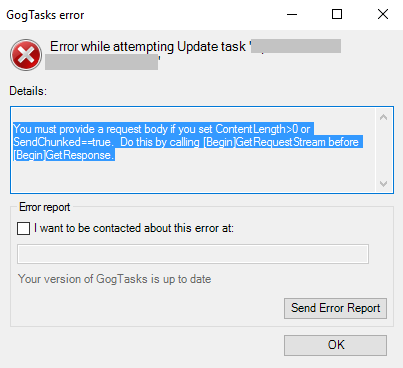 GogTasks - Error "You must provide a request body(...)"
Error "You must provide a request body(...)"
You must provide a request body if you set ContentLength>0 or SendChunked==true. Do this by calling [Begin]GetRequestStream before [Begin]GetResponse. 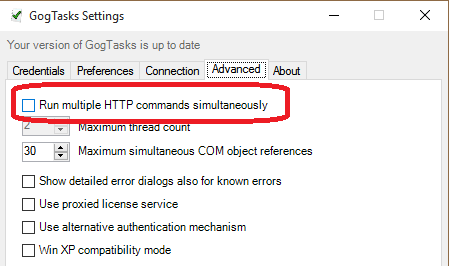 If you're receiving this error while synchronizing please go to the GogTasks settings dialog, click Advanced and uncheck "Run multiple HTTP commands simultaneously".